They know that the best holidays are found in the magical time when crowds are thin, prices are lower and temperatures are less than sweltering. In the Pacific Northwest, the spring shoulder season occurs during May and June, after winter has receded and before the schools release their wandering herds. Note: Gray whales migrate through the area during spring months. Your chances of spotting one can increase! Imagine the spring breeze in your face as you sail among the hundreds of islands in the San Juan Islands, lush vegetation everywhere. The spring flowers are in full bloom, and the world is positively bursting with life. Now imagine doing it for hundreds less than you’d pay for an all-inclusive sailboat charter during the summer high season. Sounds great, right? There are fewer people around. In the San Juan Islands, you’ll never see the hordes you’d expect at Disneyland, no matter what time of year. But in the spring, the crowds are even fewer than normal, and you can truly enjoy the famous relaxed pace of island life. The beachcombing is better. Late winter and early spring storms churn up the beaches and reveal treasures that otherwise might be hidden. Shoulder season adventures are especially good for agate hunting ― and since other beachcombers are few, there’s less competition for the best finds. The weather is better for sailing. The changing of the seasons is always an interesting time for wind watchers. 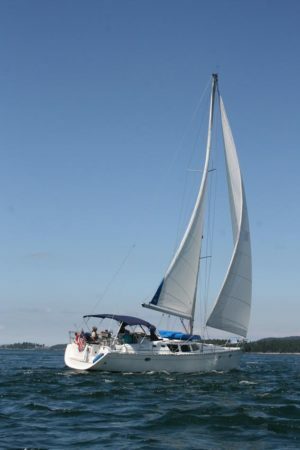 Fluctuations in temperature and pressure bring with them increases in wind, which, of course, is perfect for a chartered sailboat vacation! Mother Nature is the third member of our crew, and she’s always a reliable worker this time of year. Plus, the temperatures during spring can be more comfortable than in summer. Verdant, lush scenery abounds. Spring in the Pacific Northwest is incredible. 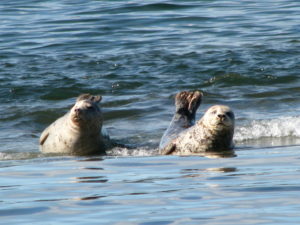 And on the Salish Sea, among the many islands ― some say say it’s the most beautiful place on earth. From the comfort of our chartered sailboat, you see the bright greens of plant life basking in newly discovered sunlight. 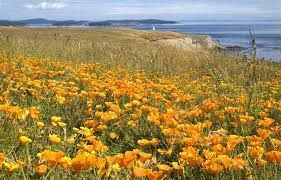 And the wildflowers, in every color and shape imaginable … they’re simply incredible! Prices are lower. If you book a multi-day all-inclusive sailing adventure this spring, you can save $400 to $1,500 off our regular prices. Hard to beat that, right? To ask about available dates or to book your San Juan sailing adventure, feel free to call, text or email us. We can’t wait to get out on the water for the spring shoulder season! We hope you can join us.